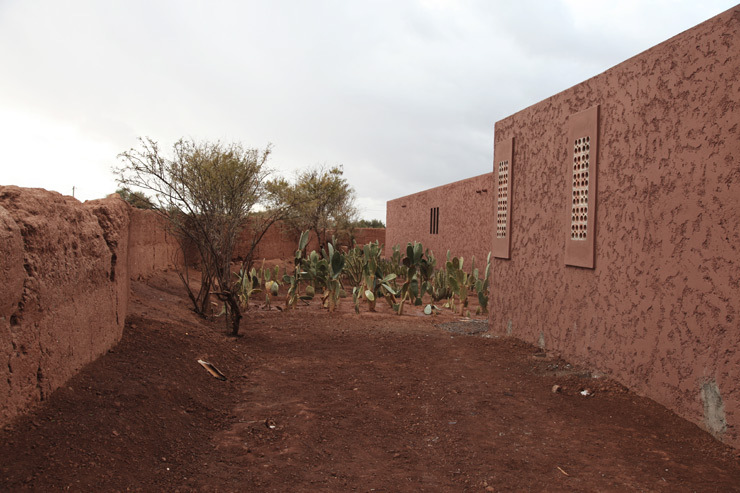 The soil in this garden is a deep rich red hue, as is the lifeblood that pumps through this modern compound with echoes of Egyptian mastaba architecture. 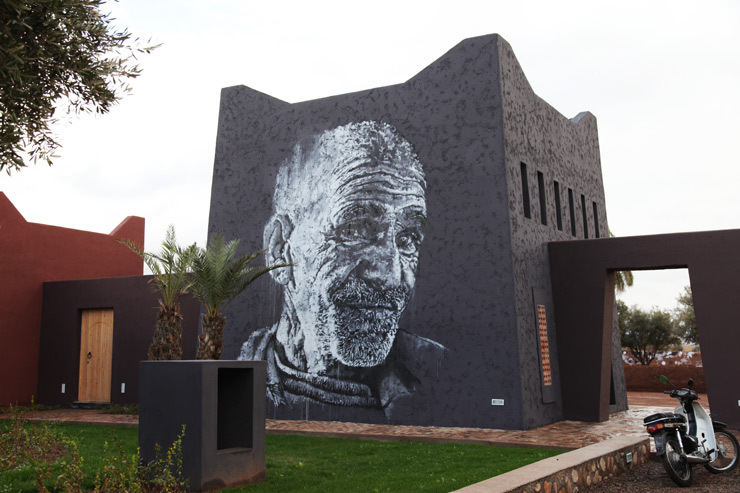 Jardin Rouge invites Street Artists, graffiti artists, and urban artists to step around the peacocks that strut around the grounds of this North African oasis and to come inside to paint. Painting outside is encouraged as well. 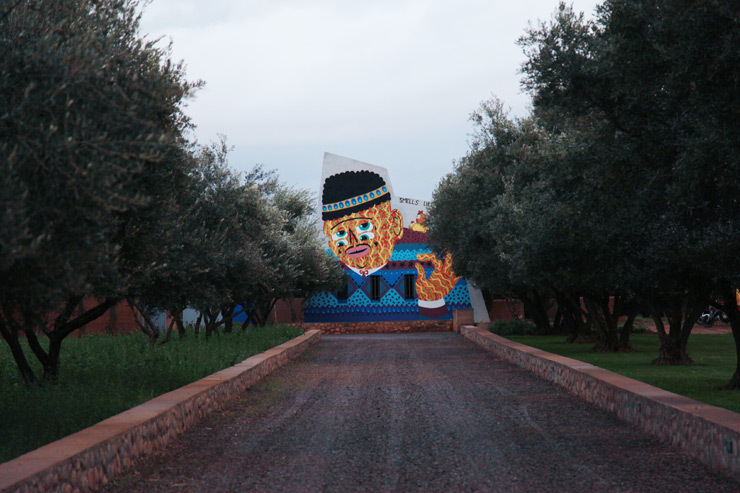 Twenty-five minutes outside of Marrakesh in the middle of a 32-acre olive grove, this is an artist's residency unlike many, where vandals are invited. They also are encouraged to push themselves creatively and develop their skills, techniques and try new disciplines outside their comfort zones. 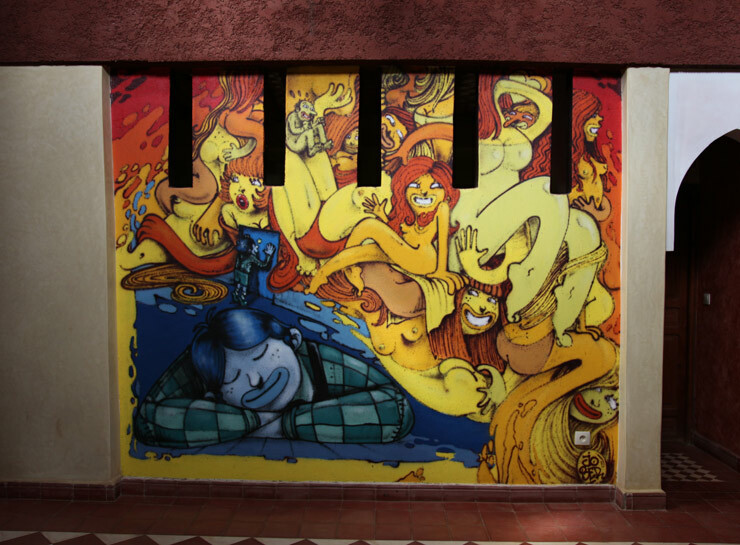 Created and funded largely by one visionary collector, a private French businessman of Russian heritage who says he discovered his own love of graffiti using china marker on city walls while he was a homeless teen in the 1960s, the residency stands apart from others in the full spectrum of support and direction it gives. From French portrait stencilist C215 and German aerosol portraitist ECB to members of New York's graffiti stars Tats Cru to the Franco-Congolese painter Kouka, the aerosol atmospherics of Benjamin Laading and abstractly juicy tag clouds of Sun7, the commonality of these street practitioners is their willingness to experiment, and their drive to produce quality work. Quietly building a reputation with this invitation-only residency, high quality shows marketed directly to collectors, and a new ambitious museum space with the Montresso Foundation, Jardin Rouge is setting its own standard. 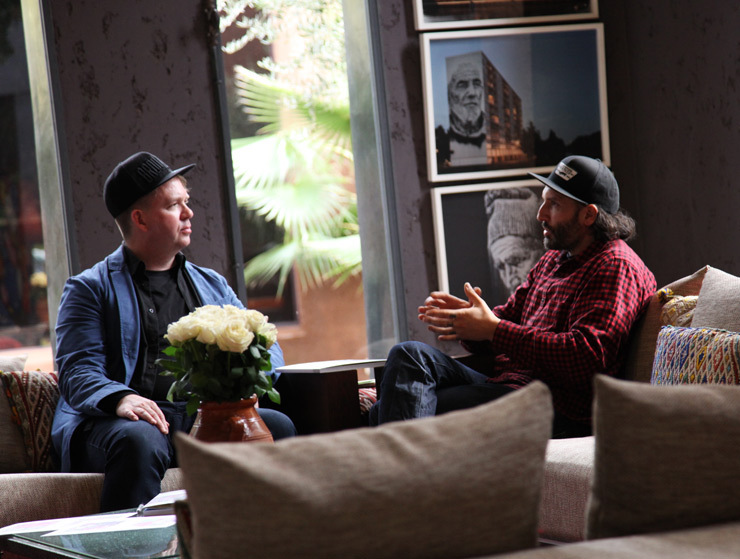 "When artists come here we ask them to express themselves in their own style. The second thing we ask is to concentrate on the quality of their work and the craft. I don't like artists who don't take care of their quality, I don't respect them," says Jean-Louis, a white maned lion with firm opinions and an empathetic gaze. "Also it is about presentation - a lot of artists have no idea how to present their work - but we always talk to the artist about how to make their final presentation, their final work." When he describes this dynamic, you realize that as an artist, no matter what level of professionalism you enter Jardin Rouge with, it will raise a notch or two by the time you leave. Speaking to current and former artists-in-residence, it's clear that it is a tight ship with an expert crew. All materials, needs, and ideas can be discussed, and there is a focus on professionalism and readiness for development. Sun7 (or Sunset), a dynamic expressionist and graffiti writer who still runs a fatcap and a thick marker across city walls in Paris, London, New York as well as the occasional corporate brand gig, told us on a recent Saturday morning that he had gone into Marrakesh the night before to party with friends until sunrise, but he was determined to get into the studio by 10 a.m. regardless. "These guys give us so much and I want to make sure I'm giving my best back too." Jean-Louis purchased the area near the Ouidane village in 2003 and began coaching his first artist in 2007, not realizing that the guidance he was giving to one would grow into the double digits in terms of artists who he now works with. The Montresso foundation is essentially sponsored by its founder and by donations from different partners and art collectors. 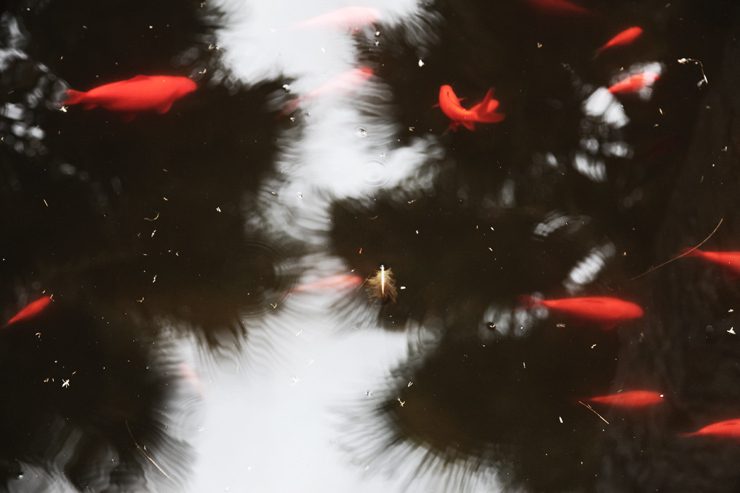 "At the beginning of Jardin Rouge this was my hobby. Then artists began hearing about this little by little and asking if they could come for a residency. We began the project slowly and became perhaps more professional and expanded our team," he says. Collectors were slow to come as well, but eventually that changed thanks to well-attended openings, studio visits, and a marketing push that produces print catalogues and video pieces about the artists. "We started to do something more attractive and more people began to hear about this, and also collectors began to hear about it. 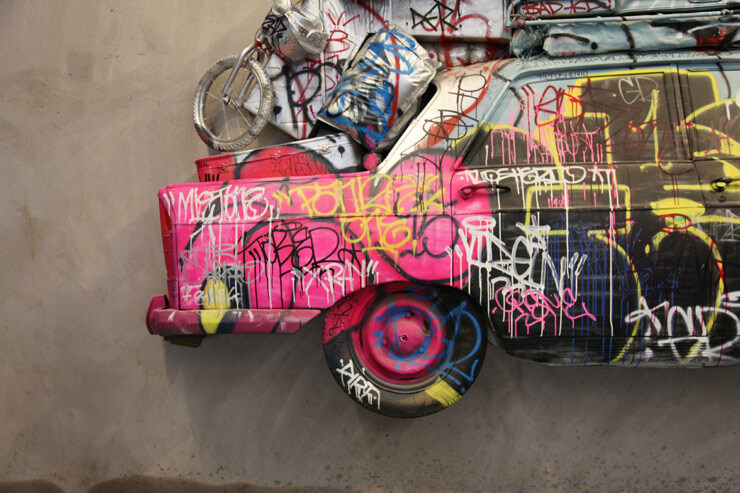 We have a lot of collectors and they are not necessarily so interested in street art per se but when they come to a place like this their perception of street art begins to change." BSA: We have noticed that it is very important here to encourage artists to test themselves in new mediums that maybe they are not comfortable with but it is perhaps your philosophy to encourage them to do something outside of their normal practice. Can you talk about that because it is not something that we normally see. Jean-Louis: At the beginning the idea was to meet with some young artists, some street artists and to give them the possibility to make something. I never want to encroach on their technique. You have your talents you have your technique. But slowly I began asking artists to please try to do something that was not in the street, perhaps with canvas or for something else. This was the idea in the beginning - to help some artists to grow. "It is a place to do something different from what you are doing in your own studio," says TILT, who has had two residencies here, and who is intensely working on two concurrent shows with Jardin Rouge this year. "I think the good thing is that you don't have the environment, you don't have the pressure that you have when you are in your own studio, in your own city and surrounded by people you know." During an interview we did with him there we found that a familiar story continued to emerge; a supportive environment can actually make artists dream bigger. "So here you can try and you can fail," TILT says. "And if you fail its okay - it's part of the game. It's a huge space and maybe you don't have to think about all of the materials because it is also easy to get them here. The structure is so well managed that if you need something, something is going to come to you. So you think totally differently, it is like a "deluxe" studio. Your mind is not stopped because you thought 'oh I wanted to do that but I can't' because the frame is going to cost too much... or I need 6 or 7 people to help me move this car from one room to another. So its like everything is possible and that can really open up your mind." 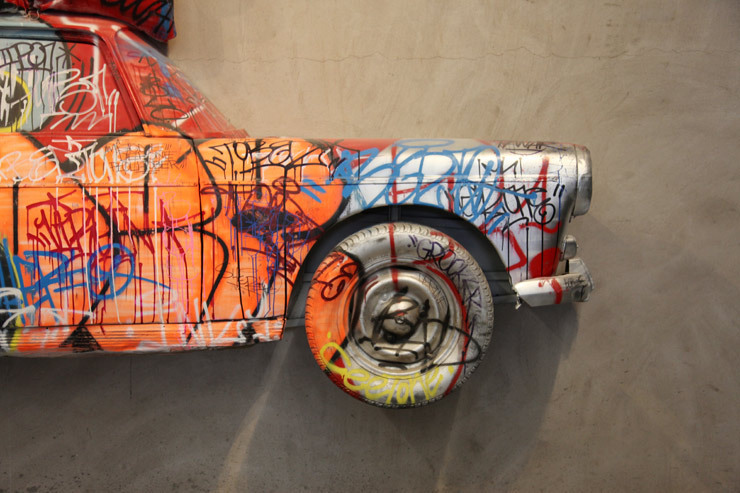 The Toulouse, France-born graffiti writer speaks from his own experience since the centerpieces of his new two-location show required cutting an entire car in half, reconstructing and stabilizing it, and mounting the half cars in two locations in two countries. 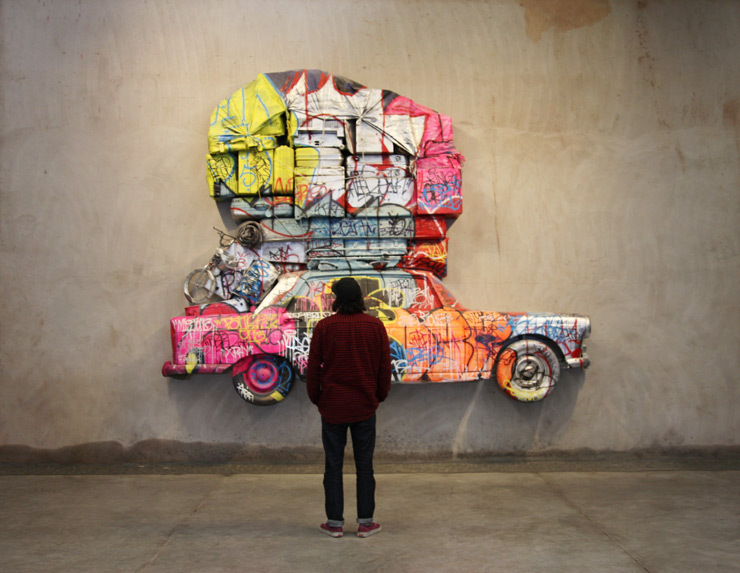 "When we decided to do the giant piece, the big car, I also wanted to experiment with something, to try to work with a different material, and since I think my work is kind of dirty - dirty graffiti, primitive graffiti - far from what Street Art can represent - I think that my work needs more knowledge about the history of graffiti, about the letters, about the texture, about accumulation. I had never worked with drywall and these other materials - it's a super difficult medium to work with and so I thought that Jardin Rouge was probably the right place to try to make it work." 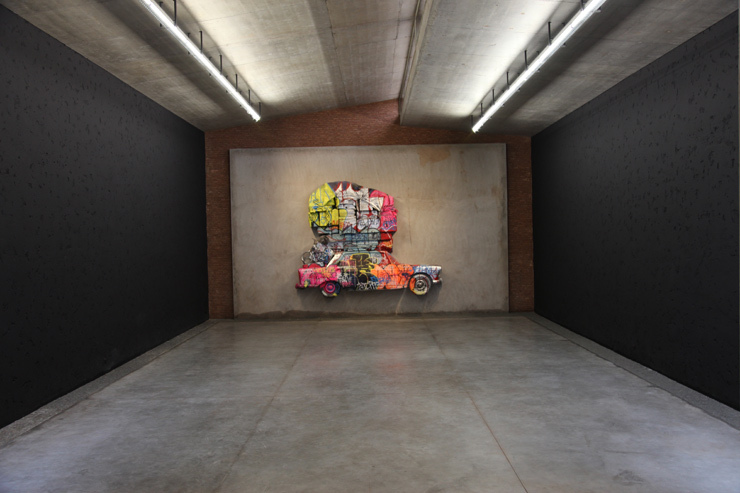 The "Voyage Aller Retour (Outbound and Return Trip)" show was constructed over many weeks and made at Jardin Rouge studios, with the "Outbound Trip" shown at the Marrakesh Biennale this spring and the "Return Trip" half shown for the Epoxy event at Musée Les Abbatoirs in Toulouse, France in June. Writer and cultural critic Butterfly describes TILT's "Voyage"; "He is fetishizing an object, the Peugeot 404 car, appreciating it for its properties regardless of its practical, social and cultural interests. Tilt sanctifies the object by vandalizing it; he breaks down the unstable and fluctuating barriers of the work of art." We had the opportunity to see "Voyage Aller" mounted inside the new spacious and modern museum-quality Montresso Foundation building and TILT's eye-popping explosion of color held its ground in the massive new modern space. For the team and the foundation partners, this inaugural show with an accompanying outdoor garden and terrace also showcases Jean-Louis' unique and powerful vision as architect as well. Alongside the reflecting pools and pens for horses, goats, cows, and other farm animals is a statue of a huge geometrically planed gorilla and painted facades with colorful character-based graffiti scattered across the property and popping in and out of view overhead. From atop one of these red roofs you can observe a wide hazy basin spreading for many kilometers south to the foothills of the snow-capped Atlas Mountains an hour and a half's drive by car. Manicured lawns, cacti, palm, and olive trees frame wending walkways that lead through the one or two story buildings and into the many indoor spaces and breezeways that connect artists studios, living quarters, guest accommodations, entertaining rooms, an ample dining area, production and professional offices. It all feels like a gallery and changing series of installations, indoors and out. As we walk with Elise Levine, the communications manager, throughout the buildings we see walls hung with canvasses of Jean-Louis' collection and others of artists who have had residencies here. 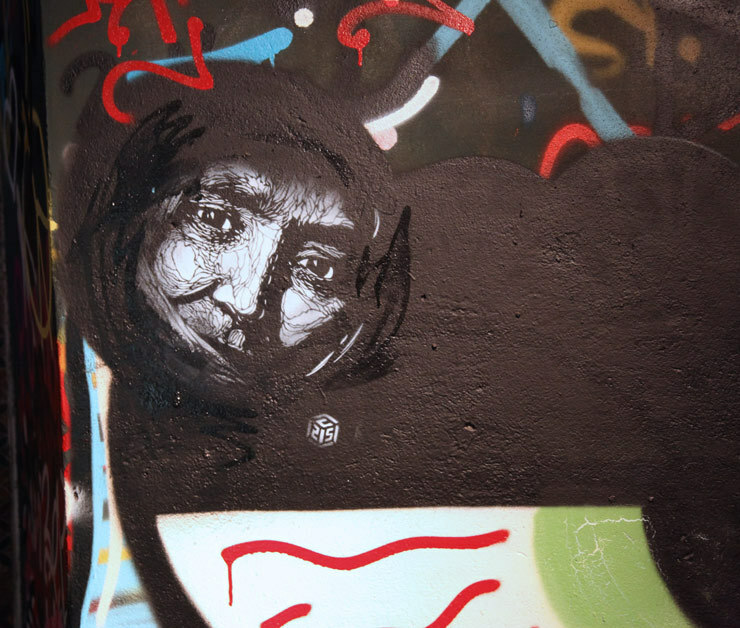 In these surroundings it is not difficult to imagine how artists can make the transition to contemporary art without losing their personal connection to the street. The sensual Fenx splashes pop beauties with thick tagging, Tarek Benaoum manifests calligraffiti as something ornamental and precise and Kashink's comic characters make wisecracks in front of you, each with four eyes. With Elise's personal warmth and knack for storytelling about artists and installations, the Moroccan wood cabinetry, mid century modern furniture, patterned textiles, and specially designed light fixtures all impart a non-restrictive peaceful environment. We had the opportunity to see an eclectic handful of the artists studios, which all come equipped with materials and tools that enable the artists to do their work and not worry about the typical concerns of artists life. 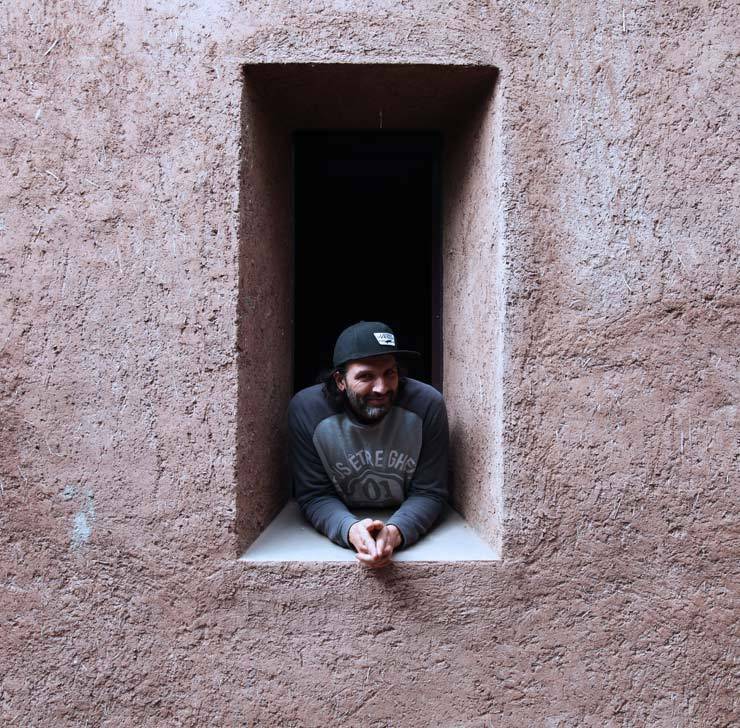 Benjamin Laading leads us into his studio, about the sized of a family one-car garage, but with a full wall of window that allows the sun to flood the space with light. 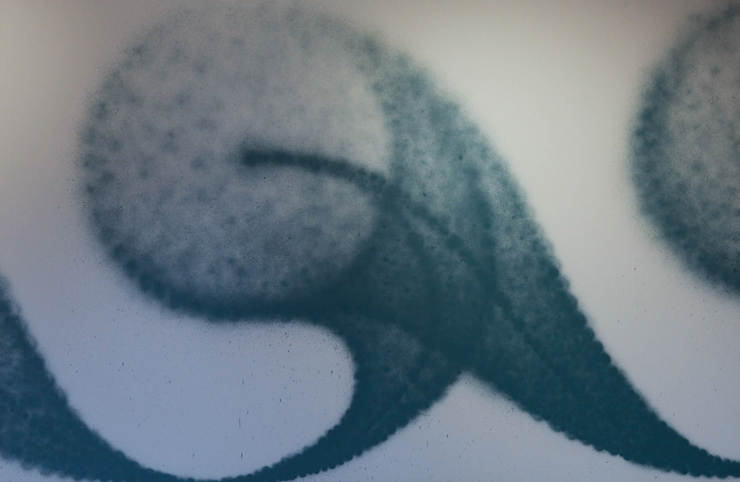 A Norwegian painter who says he still writes graffiti he is working here on capturing the impressive forms known to fat cap sprayers everywhere, the bending of light in waves of a tube-like pointillism. In fact, that's what he is turning it into. "I started to think about how I could look at and talk about the tag - the core of graffiti that is the first line, the expressive line on the canvas," he says as he pulls out his newest studies of this momentary movement of a gestural spray technique. Each canvas captures a momentary movement, but each is actually carefully hand-rendered with refined dabbing over a longer period of time to achieve the exact effect. 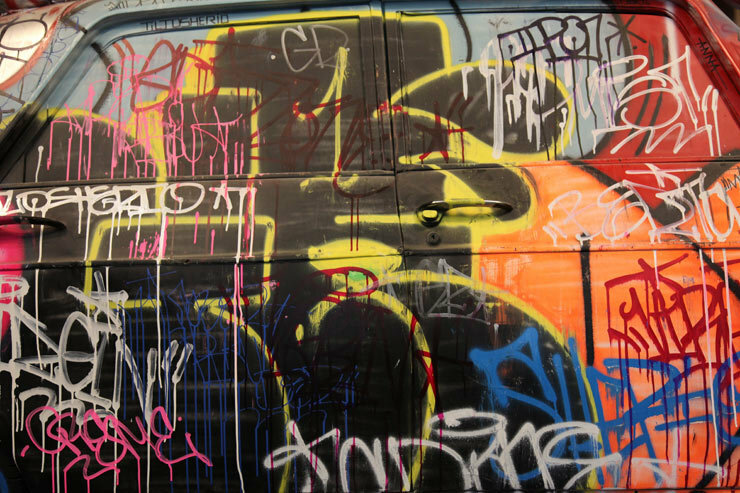 It is a tribute to the untamed wildness of quick tagging by graffiti artists but he hopes to delivery a galaxy inside the spray. "They are always pushing me to do experiments," he says, "I tried to find natural movement that looks like it was drawn very quickly." 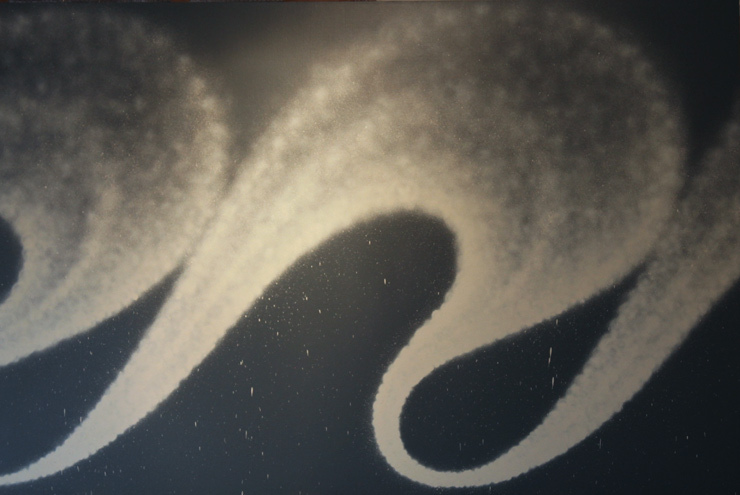 The twist is that he recreates them with a brush, painstakingly pointillizing the dust and the energy that swoops across the canvas as a painting. After all, he says, "The spray stroke is made out of an accumulation of dots." The effect is stark and energetic, atmospheric, and structural. 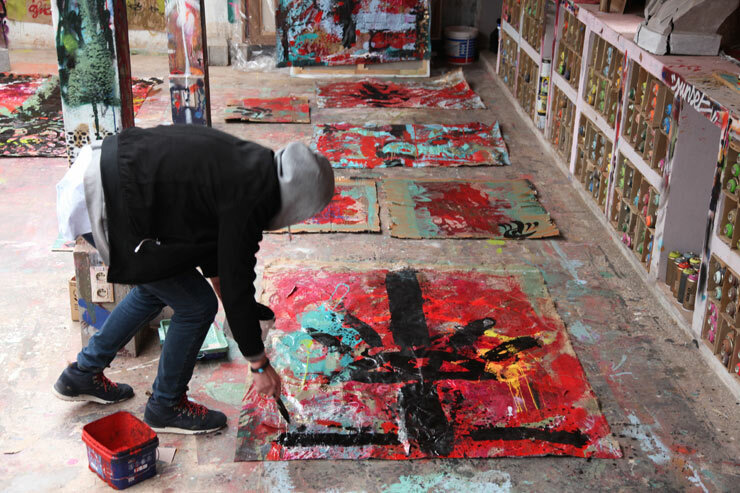 "It's really a laboratory for a lot of artists to try something new here," says Estelle Guilié, the artistic director since joining in 2014 and producing the first Jardin Rouge exhibition entitled "Behind the Red Wall" featuring a graffiti-heavy roster including BIO, BG, CEEK, and SY along with stencil artist ECB and warrior painter Kouka. 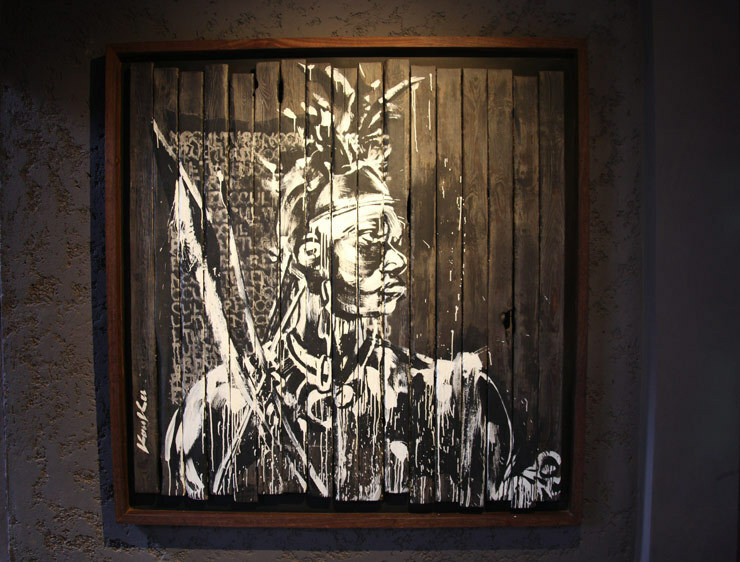 "We have one artist here who uses canvases for example all the time and I said to him 'hey man for 20 years you have worked on the same medium and you don't have your own signature. Maybe if you reflect on your work you can choose another language to express your art. He tested something new here for the first time and he has had a lot of success," she says with a smile, "and now he can continue with it." Finally, it strikes one that the entire complex is a diary, a philosophy of making work and the process of discovery. 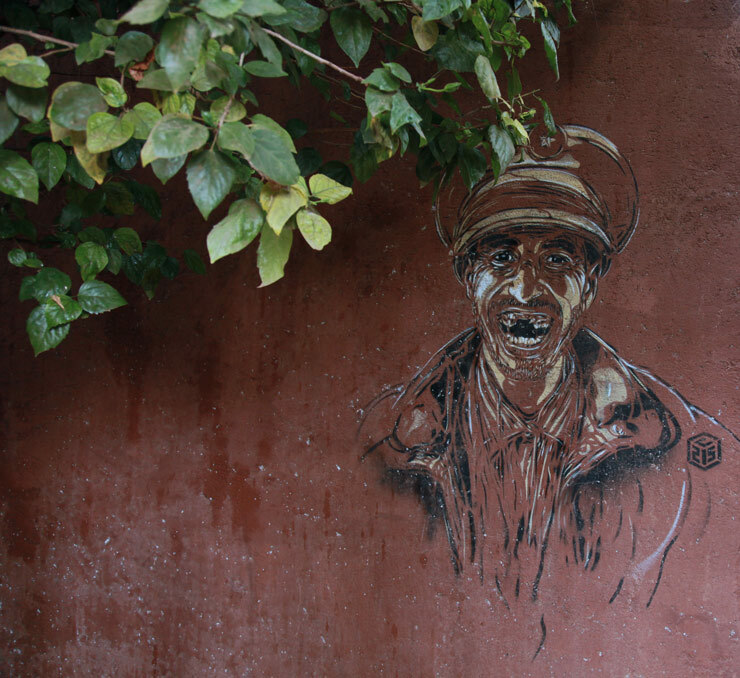 Sometime when Street Art / and Urban Art enters into a place, it dies. Here it feels alive, and many times just as consequential as it can be on the street. "It would be a great present to us if after 4 or 5 years someone sees one of these works by an artist and they say, 'This artist was at Jardin Rouge, - or Montresso Foundation - and for this person it will stand for a label of quality,'" says Jean-Louis. 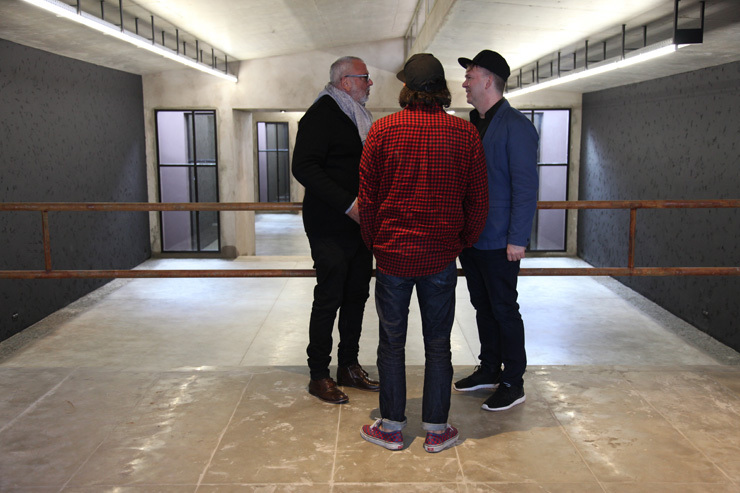 With the establishment of the Montresso Foundation exhibition space, plans are afoot to develop larger exhibitions and the expansion of a permanent collection that reflects the movement of urban art into the contemporary art realm - obviously with an eye for what comes next.